Kiev is the largest city in the Ukraine, a major industrial, scientific, educational and cultural center of Eastern Europe, population probably about three million. The city is thought to have been founded in the 5th century as a trading post for the the early Slavs. Kiev was completely destroyed during the Mongol invasion in 1240, and (obviously) subsequently rebuilt. The Ukrainian National Republic declared independence from the Russian Empire in 1917, Kiev became its capital. Following a turbulent process from 1918 to 1921, the city became a part of the Ukrainian Soviet Socialist Republic, a founding republic of the Soviet Union. The Soviet Industrialization that started near the end of the 1920s turned the city into a major industrial, technological and scientific center Joseph Stalin’s Great Purge of 1937–1938 almost eliminated the city’s intelligentsia. During World War II, Kiev was occupied by Nazi Germany from 1941 to 1943. During that period, a team of sequestered Russian officers dynamited most of the buildings on the Khreshchatyk, the main street of the city, buildings that were being used by German military. 25,000 people were left homeless. In retaliation the Germans rounded up all the local Jews they could find and massacred them at Babi Yar. Kiev quickly recovered in the post-war years, remaining the third largest city of the Soviet Union. Following the collapse of the Soviet Union and the Ukrainian independence of 1991, Kiev remained the capital of Ukraine. Kiev (and for that matter Moscow) have changed greatly following the social revolution. The drab, cramped landscape of the 80s evolved to Western-style residential complexes, modern night clubs, restaurants and comfortable hotels. We saw beautiful, spacious and VERY expensive residential areas in the ‘Burbs just like in American cities. Music from Europe and North America appears on Ukrainian radio stations. 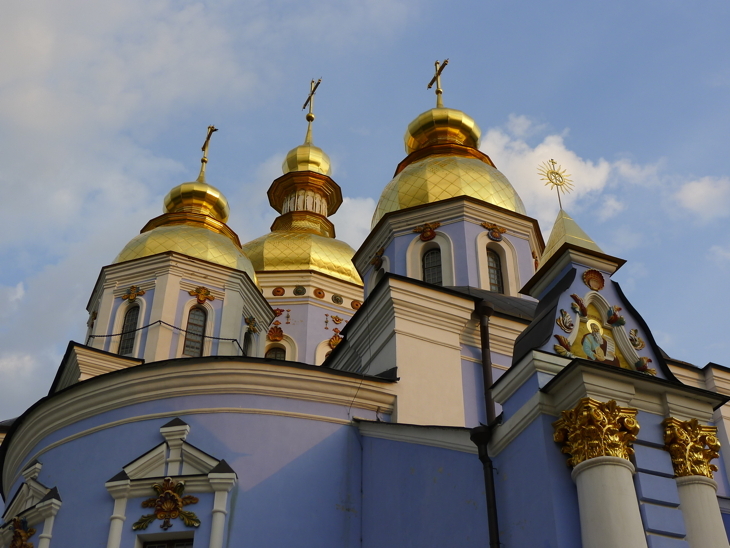 The relaxed visa rules facilitate Kiev as a prime tourist attraction. The airport is modern and efficient. Buildings have been restored, especially Khreshchatyk street in Independence Square. Many historic areas, such as Andriyivskyy Descent, have become popular street vendor locations, where one can find traditional Ukrainian art, books, and jewelry for sale. As a youth, my friend and former colleague, the late Sergei Ermakov, lived in Dnepropetrovsk, a day’s drive to the south. This entire area was closed to foreign visitors until after the collapse of the Soviet Union in 1991. Someday I’ll go back there. Enjoy the photos of this beautiful place. I home some of you someday get to travel there. 1. If you’re going any distance by air, especially if it involves overnight, scrimp and save as long as it takes to scrounge up the funds for Business Class. Travel by air is your worst nightmare in the best of situations, but having to sit in a seat the backrest of which reclines two inches with your knees up against your chest is simply torture. Squeezed into an airport gate area is extremely uncomfortable. In Business Class, you sit in a comfortable lounge with food and booze, you’re first on the plane, first off, you get good meals and a full entertainment system, the seat turns into a bed and you arrive ready to start your day instead of exhausted. This is a VERY big issue, trust me on this. 2. Try to get away with taking only carry-on luggage instead of checking bags. I took ONE roller with my clothes in a plastic bag suctioned down to a smaller volume. Take throw away underwear and clothing to make room for whatever you might want to bring back. OK so you wear one pair of pants for four or five days. Not a big deal. Then an unobtrusive backpack in which I only carried iPhone, iPad, Laptop, and camera. I had NO problem living in Europe and the Ukraine for 8 days. I missed out on all that waiting for luggage and the potential for the airline to lose it, which they still do. Air France lost Darwin’s suitcase in Paris and as far as I know he still doesn’t have it. Seems pretty hard to lose luggage using bar-codes and in a country whose President convinced Carla Bruni to marry him, but it happens. One caveat: If your aircraft in the USA is an MD 88, it’s likely your roller won’t fit in the overhead. I ended up with mine in the closet bin. Also, the foreign airlines are getting tighter and tighter about rollers. It’s only a matter of time before they ban them, I think. 3. If you are going overnight, to arrive in the AM of your destination (most trans-Atlantic flights) get someone to write you an Rx (or write it yourself) for “Sonata” (Zaleplon10 mg). It’s a short half-life sleeper (four hours) that works like a charm to get you a few hours sleep with no hangover. Safe and effective. I highly recommend it. If you get short of breath at high altitude atmospheric conditions in most flights, start diamox (acetazolamide) 250 mg the morning of departure, again at noon and again at supper. 4. Forget about getting any “free” Internet service anymore. Pretty much all the airports and hotels are stiffing you for the max with a cute twist. Several airports (including the business class lounge) advertise “free” service, and when you get in, you find out the only sites you can access are some that no one would ever access in their entire lifetime. Oh…you want to actually get into a useful site? Well……that’s “available”. 5. Anyplace in the UK is now so incredibly expensive by the time you find out the conversion factor, it’ll stop your clock. Much more expensive than New York City now. And much more nickle and diming. You pay for something and find out you aren’t getting “complete” service, you pay more for add-ons you can’t do without. Wireless in Manchester in the interim airport hotel was 19 pounds for 24 hours. Dinner for one with a glass of wine, soup and an entree was 40 pounds. 6. Security is getting more and more obtrusive. Because of the Bin Laden thing they were particularly nasty almost everywhere. Anything resembling electronics out of bags, lots of random searches, demands to see passports every 100 feet of excursion. Endless stupid questions: “Did you REALLY pack this bag yourself?? ?” “Noooooo some guy with a long beard and an AK-47 over his shoulder packed it for me”. Get over it. It’s simply a fact of life now and there isn’t anything you can do about it. Arguing and complaining will just get you searched more thoroughly. If you look remotely Indian or Arabic, you can probably count on “random enhanced scrutiny”. 7. If you’re a biker, I’ve figured out how to do it. Travel in packs like the Brits do it. I saw several packs I knew from experience had to be Brits. Completely leather bound, all riding Japanese bikes, Suzukis and Kawasakis. Five or six in a pack, all equipped with GPS, all with an itinerary and traveling tight for safety. Not safe to be a singleton in these places. 8. Double and triple backup all photographs. These shots may be irreplaceable. Having them accidentally wiped off your camera disc is easier than you think.